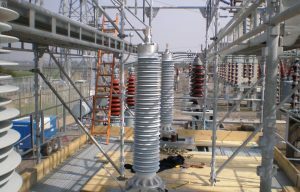 Using HAKI scaffold system for power generation sites, including nuclear power stations, is ideal. The speed, adaptability and, above all, safe methods of erection help contractors complete projects on time and within budget. HAKI offers a truly adaptable system, in which standard components can be simply configured to fit around the most complex of structures. It is compatible with most other scaffold types and components from the Universal system can also be utilized in HAKI stairs and HAKITEC weather products, making use of your prior investments.